The University of Notre Dame has been named with distinction to the 2013 President’s Higher Education Community Service Honor Roll in recognition of its commitment to volunteering, service-learning and civic engagement. Notre Dame is one of four Indiana colleges and universities to be selected with distinction. The Corporation for National and Community Service releases the Community Service Honor Roll annually. Community service and community engagement efforts at Notre Dame range across University units and are integral to the academy. Last year, the University offered 172 community-based learning courses and had 240 undergraduate students engaged in community-based research. Community service and engagement efforts include mentoring by student-athletes; teacher professional development in science, technology, engineering and mathematics; tutoring and arts programming at the Robinson Community Learning Center; and service through student clubs and organizations. Last year alone, Notre Dame’s Center for Social Concerns (CSC) estimates that some 3,500 Notre Dame students gave more than 150,000 hours of service at local community agencies, and nearly 3,800 students participated in courses that had a community-based learning component. Nationally, 1,139 students took part in service-learning courses at more than 331 sites as part of the CSC Summer Service Learning Program or the Social Concerns Seminars. All of these efforts would not be possible without the insight, expertise and commitment of community partners locally and nationally. The award was inspired by the thousands of college students who traveled across the country to support relief efforts along the Gulf Coast after Hurricane Katrina. 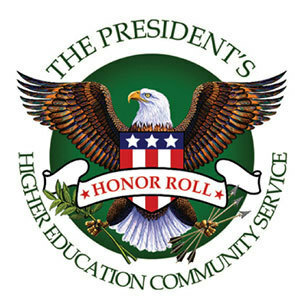 Launched in 2006, the President’s Higher Education Community Service Honor Roll annually recognizes institutions of higher education for their commitment to and achievement in community service. The President’s Honor Roll increases the public’s awareness of the contributions that colleges and their students make to local communities and the nation as a whole. Originally published by John Guimond at newsinfo.nd.edu on March 12, 2013.